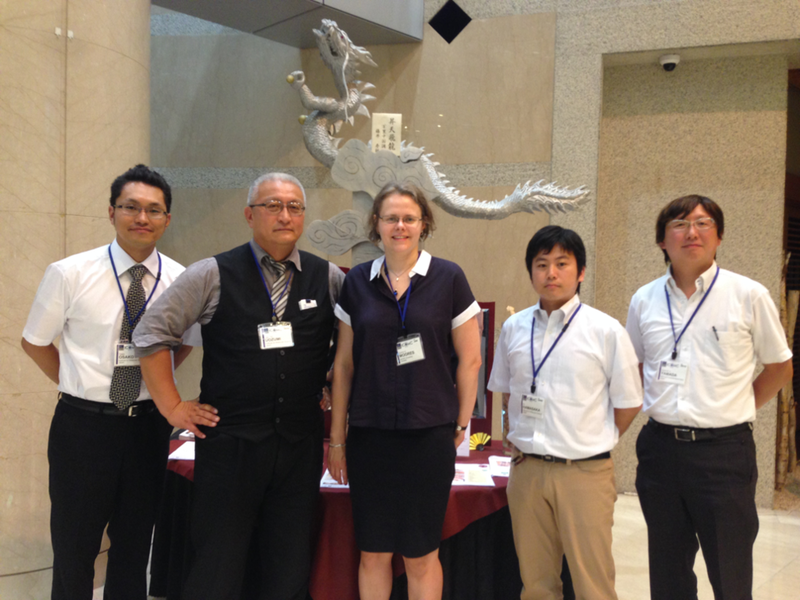 Here at the 26th International Conference on Organometallic Chemistry, Sapporo, Japan with Uozumi group. From left to right: Takao Osako, Yasuhiro Uozumi, Moores, Go Hamasaka, Yoichi M. A. Yamada. The Moores group collaborates with other researchers around the globe to share and gain expertise, exchange exciting ideas, cease funding opportunities and offer our trainees a unique collaborative experience. I have built a strong network of collaborators, within Quebec, Canada and abroad. Together we have secured 5 team grants. C.J. Li (McGill Chem., 11 pub., 1 subm., 2008-present, organic chemistry), Subhasis Ghoshal (McGill Civ. Eng., 1 pub., 2008-present, nanoparticles in environmental remediation), Tomislav Frišcic (McGill Chem., 5 pub., 2011-present, mechanochemistry), Prof. Nadi Braidy (U. Sherbrooke Chem. Biotech. Eng., 1 pub., 2011-present, transmission electron microscopy), Yasuhiro Uozumi (RIKEN institute and IMS,Tokyo and Okazaki, Japan, 1 pub., 2012-2013, polymer science and flow chemistry), Gregory Chatel & Karine Vigier de Oliveira (2 pub. U. Poitiers/Grenoble, France, 2014-present, biomass), Zach Amara (CNAM, France, 2018 -present). Now as a co-leader of the MSSI-Materials theme at McGill, my group is engaged in an exciting and highly collaborative research project with 11 researchers at McGill across 6 faculties on developing sustainable materials for energy applications (2017-present).